HUAWEI always provides the innovative devices and good quality products for its customers to stay connected with their love ones. HUAWEI has the three main business groups providing the good quality products including mobile phones, wearable, tablets and laptops to its customers. Now Huawei Consumer Business Group (CBG) bring much more for its customers in this Holy month of Ramzan. Huawei customers hash tagging as (SayShukran) by sharing its goodness with you in this Ramzan. HUAWEI Pakistan offering an exciting surprise for its fans and customers through Huawei Ramzan Promotional Activity 2018. Buy any HUAWEI Phone and become the part of this lucky draw for winning the wonderful Exciting Gifts. It is Huawei Ramzan Promotional Activity and Mega offer as SayShukran. Here is the complete details about the registration process, Exciting Gifts, starting and ending dates and main location points of Huawei Ramzan Promotional Activity 2018 with the hash tag of SayShukran. Buy any Huawei Phone and get a chance to win the Exciting Gifts and become the part of lucky draw. Visit any nearest HUAWEI Stall to win instant Exciting Gifts on purchasing new Huawei phone of your choice. Enter the Mega Lucky Draw Exciting gifts. Spin the wheel and win gifts on daily basis. Win Brand New Cars (Mehran Suzuki Car). The winners of Car Lucky draws will be announced on BOL Channel in the live transmission of (Game Show AiSay Chaly Ga). 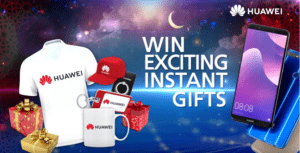 So Stay Tuned with Huawei & BOL News Channel to get a chance to win Exciting gifts every day. This Huawei Ramadan Promotional Activity is starting from 1st June 2018. The ending date is 14th June 2018. The main location points are the big cities of Pakistan as Lahore, Karachi, Rawalpindi, Multan and Faisalabad.